Home » Top Stories » Chandra Babu - Mahanagaram lo Mayagadu! Chandra Babu - Mahanagaram lo Mayagadu! The YSRCP leader said that Chandrababu who released 9 white papers should reveal how much he has spent on buying MLAs. He demanded Chandrababu for the release of a white paper based on the implementation of the manifesto. 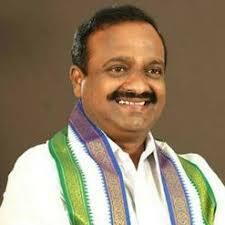 Hyderabad: YSRCongress leader Balasouri lambasted Andhra Pradesh Chief Minister N Chandrababu Naidu. He ridiculed Chandrababu saying, “biopics are being made on the life of former Chief Ministers Dr. YS Rajasekhara Reddy, NTR and Jayalalitha. One should be made on Chandrababu and named Mahanagaram lo Mayagadu(Cheat In The Metropolis) and U-turn Mosagadu (U-turn Cheat)." Talking to the media at the party office, he exuded confidence that YSRCP is going to win the upcoming election in 2019. Chandrababu and his Nara Lokesh are trying to mislead people, he added. Balasouri pointed that Chandrababu has failed miserably in constructing the High Court building for AP though he had submitted an affidavit in the Apex Court saying that the building would be ready by December 15. He is now citing lame reasons is evade the questions. He added Chandrababu has taken away the value of the expression and spirit of Dharma Porata Deeksha.